The city of Leadville, Colorado purchased the historic Tabor Opera House in 2016 with grants received from the Colorado Department of Local Affairs, History Colorado State Historical Fund, El Pomar Foundation, Boettcher Foundation and Gates Family Foundation. 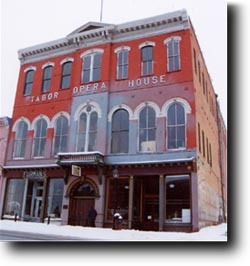 The opera house is now under the management of The Tabor Opera House Preservation Foundation, which has embarked on a mission to preserve and renovate the building and create a cultural and community center in Leadville. Thank you - 2017 SEASON SPONSORS! A Showcase of our past. A Stage for our future. Drive into the mountains, traversing beautiful Wilkerson Pass to the two-mile-high city of Leadville. Isolated ghost towns like Leadville are tucked into the mountains all over Colorado, whispering tales of fortunes won and lost during the heyday of the gold rush days. 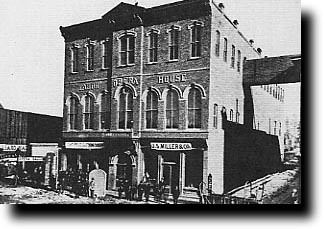 The discovery of gold in 1859, and later silver and lead, turned Leadville into one of the wealthiest cities in the nation for a time, attracting the rich, the hopeful and the infamous to its streets, show houses, saloons and theatres by the thousands. As one of America’s last remaining authentic mining towns, Leadville has a wealth of historical attractions, including the federally chartered National Mining Hall of Fame Museum, the Healy House & Dexter Cabin State Museum, and the Tabor Opera House. Enjoy free time to explore the town’s 7-block National Historic Landmark District before continuing through breathtaking alpine passes to the chic resort town of Vail for a two-night stay. In this documentary the former owners of the Tabor Opera House and community members discuss their hopes and dreams for this historic landmark.